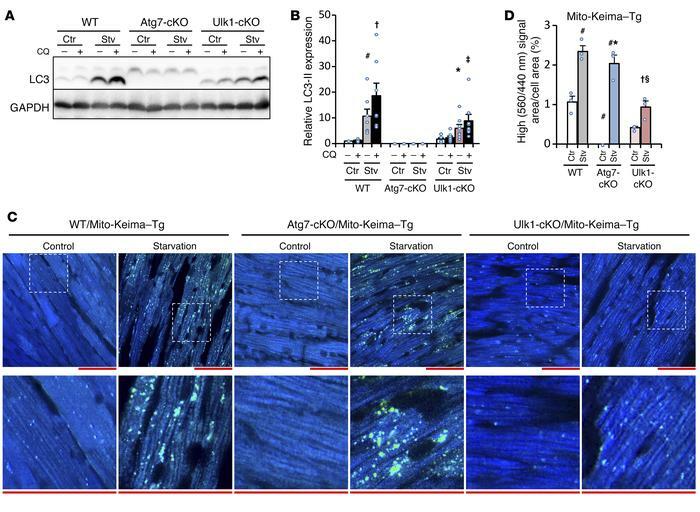 Ulk1- but not Atg7-dependent autophagy protects the heart against physiological energy stress through activation of mitophagy. Mice were subjected to 48 hours of starvation. Error bars indicate the SEM. (A and B) Protein levels of LC3 in the heart were analyzed after chloroquine administration (10 μg/kg i.p.) during the 48-hour starvation period to evaluate autophagic flux. (A) Representative immunoblot and (B) summary of relative expression of LC3-II (n = 7–8 per group). #P < 0.05 versus WT, control, and no chloroquine; †P < 0.05 versus WT, starvation, and no chloroquine; *P < 0.05 versus Ulk1-cKO, control, and no chloroquine; ‡P < 0.05 versus Ulk1-cKO, starvation, and no chloroquine (paired Student’s t test). (C and D) Lysosomal degradation of mitochondria was examined in the hearts of Mito-Keima–Tg mice during starvation. The bright signal corresponding to a high 560/440-nm ratio shows lysosomal localization of Mito-Keima protein, indicating mitophagy. (C) Representative images are shown. Scale bars: 50 μm (top); original magnification, ×3 (enlarged insets, bottom). (D) Summary of signal area/cell area ratio (n = 3 per group). #P < 0.05 versus WT and control; †P < 0.01 versus WT and starvation; *P < 0.01 versus Atg7-cKO and control; §P < 0.05 versus Atg7-cKO and starvation (Tukey-Kramer’s test). CQ, chloroquine; Ctr, control; Stv, starvation.